Our outlook for The Next Phase of the Shale Revolution asserted that US onshore oil output would decline in response to lower oil prices, though basins with the lowest production costs ultimately would take market share. This analysis has informed our positioning in the upstream segment, with shares of the three high-quality oil and gas producers that we added to our model portfolio in January 2016 up an average of 82 percent over the subsequent months. Our selection process targeted names with strong balance sheets, low production costs, a history of solid execution and franchise assets that can deliver output growth in a challenging environment. With oil prices a point of pain or profit for all upstream operators, names that can deliver on a volumetric growth story and take market share should outperform. 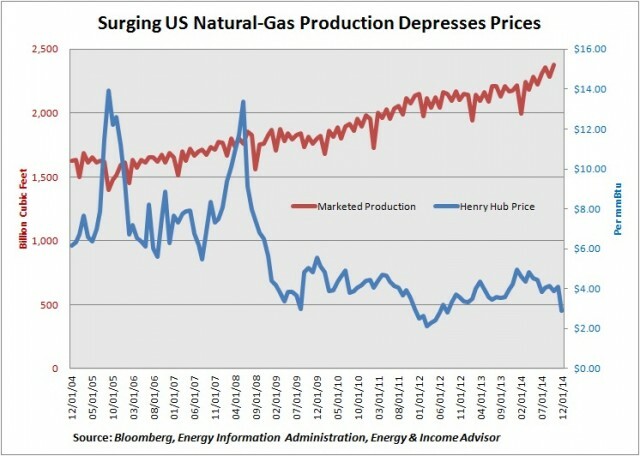 Although luck plays a role in every successful and unsuccessful investment, we based this call on what had transpired in the US gas market over the past five years. 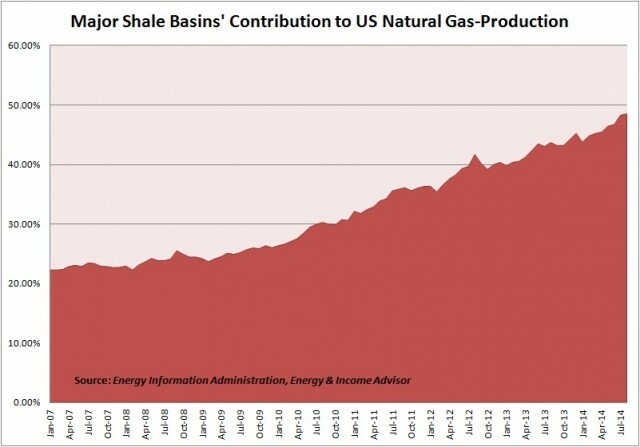 Consider the golden age of US natural gas, a period when shrinking domestic supply elevated the price of this commodity, incentivizing the development of higher-cost production and the commercialization of the Barnett Shale and the Fayetteville Shale—the forebears to Appalachia’s mighty Marcellus Shale. But these salad years eventually wilted. Surging hydrocarbon production from prolific US shale plays overwhelmed domestic demand for natural gas, depressing the price of this commodity to less than $3 per million British thermal units (mmBtu) from a peak of more than $13 per mmBtu in summer 2007. Producers responded to the pain by shifting their drilling activity to plays that offered the best returns. 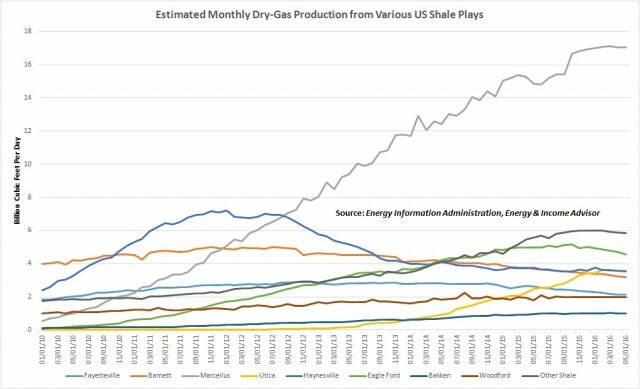 The seven major unconventional plays that the EIA tracks in its Drilling Productivity Report accounted for a whopping 48.6 percent of US natural-gas output in August 2014. Three years earlier, this figure stood at about 30 percent. This trend reflects surging output growth that has outpaced steadily declining production outside these seven major plays. At an even higher level of granularity, we can see that production has surged in the basins that offer the best economics and declined in those that generate inferior returns in the current pricing environment. Appalachia has emerged as the low-cost producer of natural gas in the US. 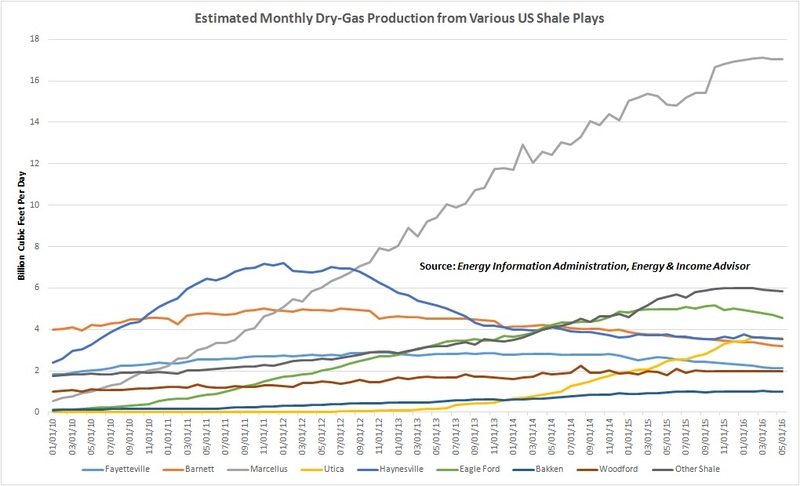 Over the past half-decade, dry-gas production from the Marcellus Shale has surged, while output from older gas-focused shale plays has tumbled. This trend looks set to continue. Although US natural-gas prices will probably remain range-bound over the next several years, low-cost basins such as the Marcellus Shale and Utica Shale will continue to take market share from marginal areas of production such as the Fayetteville Shale and the Barnett Shale. In contrast, over the past several years, the number of active rigs in gas-focused plays with less appealing economics has declined dramatically. With US oil production showing signs of bottoming and the rig count rebounding from its nadir, the scenario that we outlined in April 2015 appears to be playing out. Although crude-oil volumes have started to roll over in all four of the major shale plays tracked in the Energy Information Administration’s Drilling Productivity Report, the Eagle Ford Shale’s output has suffered the sharpest decline, in part because the basin produces a higher proportion of condensate, natural gas and natural gas liquids. Wellhead economics in the Eagle Ford Shale’s dry- and wet-gas windows have suffered the most, though producers with high-quality acreage in Dewitt County and Karnes County can generate solid returns with West Texas Intermediate crude oil in the mid-$30s per barrel. That’s why the Eagle Ford Shale has suffered the sharpest decline in active hydraulic-fracturing units and boasts the second-largest inventory of drilled wells awaiting completion—a backlog that producers likely will tap as energy prices recover. 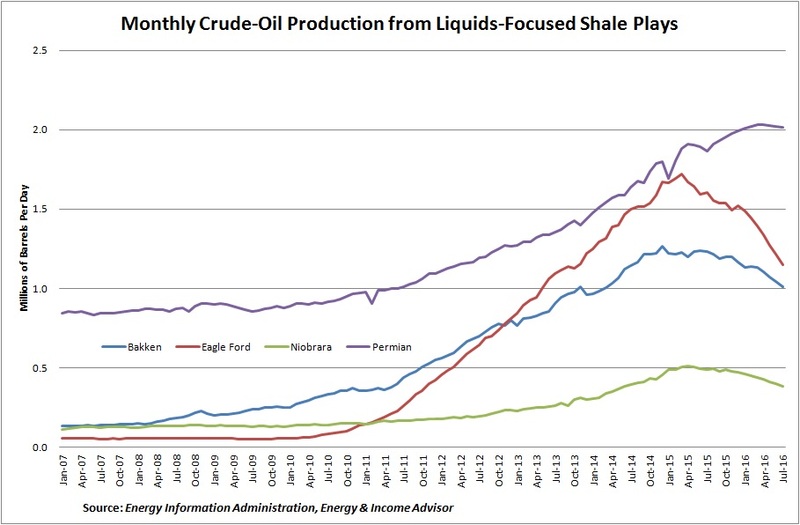 Besides challenging economics, wells of recent vintage account for a greater proportion of production in the Eagle Ford Shale; with a smaller base of legacy production than in the Bakken Shale and Permian Basin, crude-oil output in this region has more exposure to the steeper decline rates that occur in the first few years after a well is completed. In contrast, oil output from the Permian Basin in West Texas has remained relatively resilient, reflecting a sizable production base from legacy wells and some of the lowest break-even rates in the US onshore market. Independent oil and gas companies that focus on this region command premium valuations in the stock market and encountered no problems issuing equity when crude-oil prices plummeted in late 2015 and early 2016. Integrated oil companies such as Chevron Corp (NYSE: CVX), Exxon Mobil Corp (NYSE: XOM) and Occidental Petroleum Corp (NYSE: OXY) likewise boast legacy acreage in the Permian Basin and plan to ramp up development in coming years. Against this backdrop, the main operators in the best parts of the Permian Basin enjoy lower break-even costs than their peers in other shale plays and have no problems accessing capital to accelerate their development plans. No wonder that the number of active drilling units in the Permian Basin bottomed about one month before the US oil-directed rig count and has made the largest contribution to the recent recovery in drilling activity. 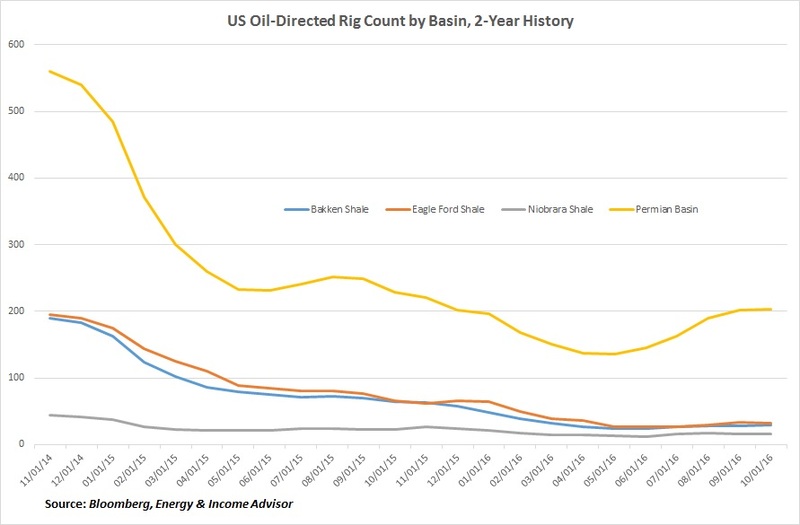 The Permian Basin has emerged as the shale play that’s most likely to take market share in an environment where oil prices range between $40 and $60 per barrel, while the core areas in the Bakken Shale and Eagle Ford Shale can also hold their own in this price range. Even EOG Resources (NYSE: EOG), arguably one of the best-run independent exploration and production companies in the US and an early mover in many of the biggest shale plays, recently forked over $2.5 billion acquisition of privately held Yates Petroleum. This transaction gives the company another 186,000 net acres in the Delaware Basin and 138,000 net acres in the adjacent Northwest Shelf play in New Mexico. Over the intermediate term, we expect short-cycle US shale plays to take share in the global oil market, as project delays and reduced investment in capital-intensive offshore projects accelerate the natural decline rate in non-OPEC countries outside North America. Onshore basins with the best economics stand to benefit the most from this opportunity. 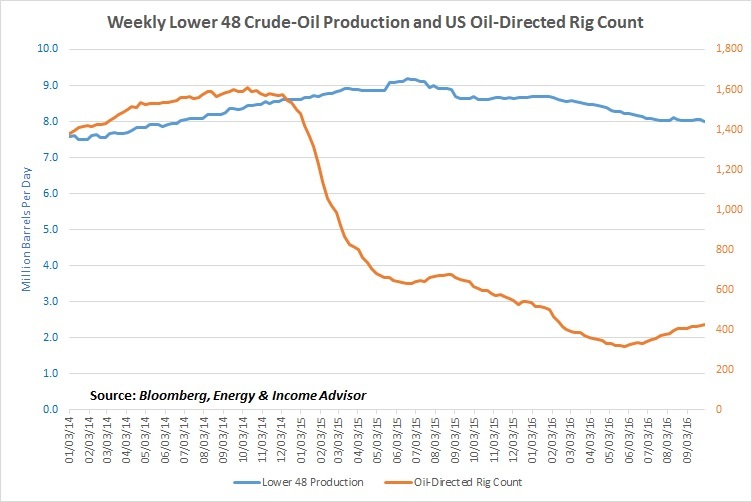 Bottom Line: US oil production appears to be bottoming, but investors seeking to profit in an environment where prices will likely range between $40 and $60 per barrel must pay attention to basin-specific trends as well as companies’ balance sheets and acreage quality. 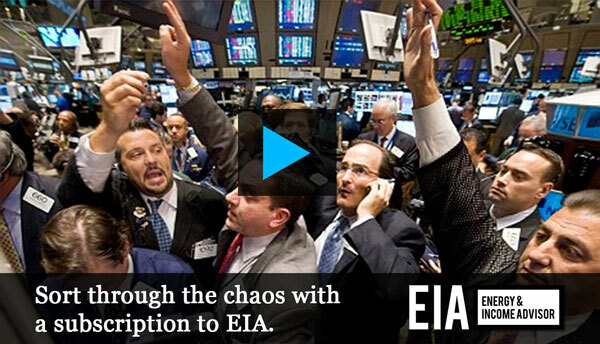 Much of the easy money has been made in energy stocks. Going forward, selectivity will be critical to generating differentiated returns. Subscribe to Energy & Income Advisor today to get an edge on the competition. On the fence about subscribing? We understand. Check out a sample issue before you commit.